Had another blustery but excellent day on Hellvelyn today. I ski toured up from Dunmail Raise after about an hour of walking. The slopes have been fairly scoured in most places by the winds, but hollows, and re-entrants are hanging onto the snow nicely and I was treated to a fantastic powder ski back down! 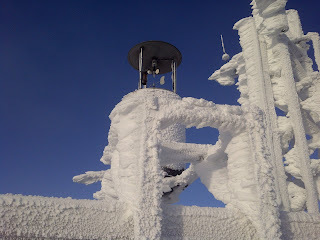 It's all very winter and 'Lake District' up there and expect to need to use your crampons if you head onto the tops. Cornices of new soft slab are forming above the gullies and would certainly collapse if anyone were to wander onto them. Well, we've had it all in the Lakes in the past 3 days. Freezing temps, lots of snow, 80mph wind, now a thaw and more snow! So i took myself up ski touring into the Bowscale Tarn area, which is part of the Skiddaw massif, to do a bit of a recce and see what is happenning with the snow. And what I found was this! 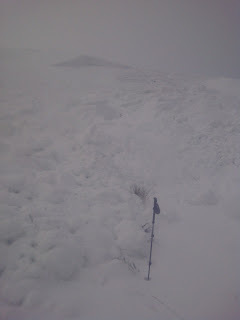 A full blown cornice collapse and full depth avalanche. There was a lot of debris (you get a sense of the size from the ski pole) and the crown headwall (the bit it broke away from at the top) was about 3ft high, pretty big. It would definately have done someone a mischief if they were in it and as I stood thinking this, a great ripping noise started and the rest of it came down. It didn't get anywhere near me, but any plans to head higher up that slope were binned! So i turned tail and had a very pleasant, if wet and windy ski back down. There is a lot of snow on these lee slopes, and this one was low. And with temperatures rising and it all getting wet and heavy, more of this is likely. Tomorrow night is due to bring colder weather again for the weekend, so after a good freeze all will be awesome. As for us? Well we're out on saturday with some clients from down south for our first winter skills course of the season, fingers crossed they get good conditions. 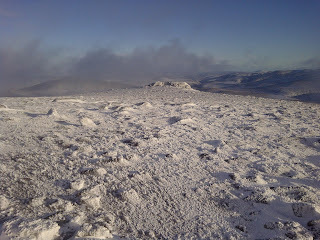 We've just gotten back from 3 fantastic days in the Cairngorms Winter Mountaineering and Ski Touring. It had been a bit of an 'over keen, there might be snow' type trip, but as it turned out the heavens opened, the temperature fell and we had a great time. We headed into Gen Feshie, south of Aviemore, and went up Carn Ban Mor 1052. It was a cold and very windy day, with googles on for the duration, winds gusting 60mph and at the top hardly any visibility...great stuff! We then headed north and up onto Sgor Gaoith 1118 and on again to Sgoran Dubh Mor 1111. The thing with a lot od Scottish Hills is they are such a long way from the car, so once you are near them, it's daft not to get as many in as you can. The problem is, you end up doing a 22km day! 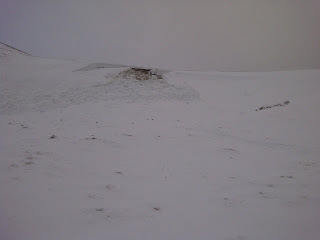 The hill was in got winter nick from 500m upwards, not much deep snow, but some neve and lots of ice and frozen ground. Day 2 was a solo day for me, Ali was having some retail therapy and a rest. 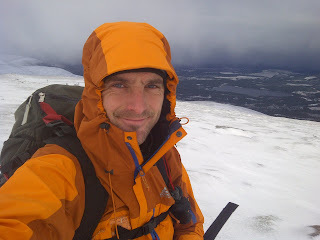 These can sometimes be tough, finding the energy to do a big day on your own, but with pretty challenging conditions, I found plenty of motivation pitting my skills against some typically Scottish winds and blizzards. I started at the bottom ski carpark near Glen More and headed into Coire na Ciste, thinking I'd get shelter from the westerly's. 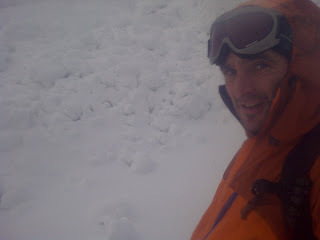 I got shelter, but also deep snow and deeper heather! Several hours of battling got me up onto Cnap Coire na Spreidhe 1151 and into a white out with 50mph winds and about -10'c with wind chill, brilliant! Then , with some proper navigation needed, I headed up to the top of the mighty Cairngorm 1245, and as the clouds lifted was treated to some amazing views. With Ali recovered and a little more snow fallen, we thought we'd risk a little ski touring foray around the back of Cairngorm to a hill called Bynack More 1090. We managed just about to ski from Glenmore Lodge up to the Ryvoan Bothy and up onto the flat plateau below the final 1km onto the top. To say we were slightly battered by this point would be an understatement and having just done 10km to get here and only having 2hrs of daylight left we made the tough, but sensible decision to turntail and ski back. I'd thought we were going to have all sorts of problems sking back down the hill with it's modest amounts of snow and copious amounts of heather...but no bother. You couldn't turn, but hey, who needs to turn! Then to cap it all, we get home and the Lakes is white! So i'm off out to have more adventures i the Lakes!